2003 Bee Hive Eric Daze silver hockey card parallel. 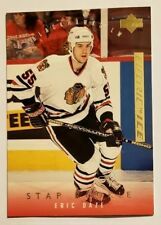 This great card features the Blackhawks, and is serial numbered 60 of 67. The card is in nm condition (colorful, crease free surface). 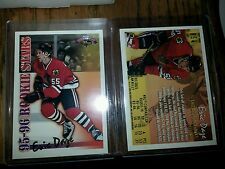 2 1996 ERIC DAZE DONRUSS CANADIAN ICE #14 OF 16. NUMBERED HOCKEY CARD. WITH VERY RARE XXXX/2000 !! THE OTHER CARD 0318/2000. 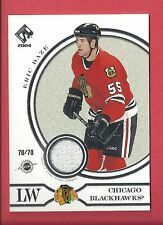 GOLD PARALLEL1995 96 UPPER DECK ELECTRIC ICE GOLD STAR ROOKIE CARD #268 FEATURING ERIC DAZE AS A ROOKIE WITH THE CHICAGO BLACKHAWKS. PLEASE VIEW AND ENLARGE PHOTOS OF THE ACTUAL CARD TO BE DELIVERED TO THE WINNER. 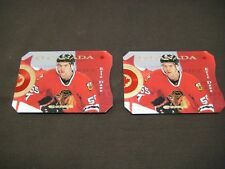 I AM NOT A GRADER AND NO GRADE CAN EVER BE GUARANTEED BUT THE CARD APPEARS NRMT/MINT OR BETTER. PLACING A BID OR OFFER CERTIFIES ACCEPTANCE OF CARD CONDITION. SHIPPING VIA USPS IN A PLAIN WHITE SECURITY ENVELOPE WITH SPECIAL HANDLING. THANKS FOR LOOKING AND GOOD LUCK!! 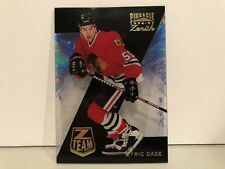 1996-97 Zenith Z-Team #14 Eric Daze Chicago Blackhawks RARE! Cards are from the regular 300-card hand-collated issue and the 100-card Rookie & Traded Update Set. The 17 cards in this team set include Item(s) must be in their original scanned condition. Marc Lamothe (RC). The 20 cards in this team set include Item(s) must be in their original scanned condition. Igor Radulov. Jocelyn Thibault. Burke Henry. Craig Andersson. Alex Zhamnov. Kyle Calder. 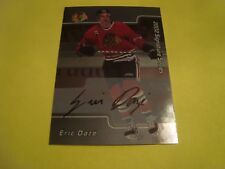 THIS AUTOGRAPH OF ERIC DAZE WAS ACQUIRED ON DECEMBER 9TH, 1995. IN CHICAGO PRESENTED BY NEW AGE SPORTS. GREAT CARD TO ADD TO YOUR SET, TEAM OR PLAYER COLLECTIONS. 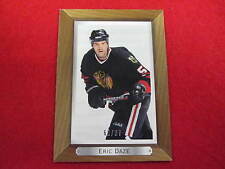 2003 Pacific Private Stock Reserve Patch Memorabilia #152 Eric Daze Hockey Card! The card is # LL4, Eric Daze. The card is in very good condition.